DIGITAL ACTOPHOTOMETER (ACTIVITY CAGE) is designed to study the spontaneous or induced or locomotors activity in small animals like mice or rates. In this apparatus, we have used the optical sensors and emitters to record the horizontal movements of the animals on a six digital counter display. 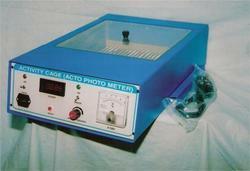 Glass Agencies EROSE are manufacturer of Acto photo meter. This is an all solid state instrument for monitoring spontaneous & induced ambulatory activity of laboratory animals. Improved and solid state type with six photo cells for measuring spontaneous or induced activity with digital totalizes or counter. By utilizing skills of our dexterous workforce, we are offering a comprehensive assortment of Digital Actophotometer. This is an all solid state instrument used in the laboratory and hospital for monitoring spontaneous & induced ambulatory activity of laboratory animals. 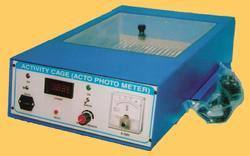 We are engaged in offering technologically advanced range of Actophotometer. Actophotometer is used for measuring spontaneous activity with the help of digital counter. We are amongst the reliable Manufacturers, Exporters and Suppliers of Actophotometerfrom Lucknow in Uttar Pradesh. Actophotometer is equipped with six LEDs that are durable and eicient. It consist of 6 built in photo sensor and 4 digits digital counter to indicate the Locometer activity. It measures the spontaneous & indicated activity with digital totalizer. It also incorporates electric shock of upto 100V for activating rats. The stimulus is variable from 0 to 100V & indicated on meter. We are interested in only Bulk quantity orders. (Actophotometer) improved and solid state type with six photo cells for measuring spontaneous or induced activity with digital totalizer or counter. (c)This model is micro-controller based. Riding on unfathomable volumes of industrial expertise, we are engaged in trading a broad assortment of Laboratory Actophotometer. Use: Allows the study of Spontaneous Locomotor activity, rearing, and optional hole-board test parameters for exploration in rodents.